Great screw where instalation and removal without tools is desired. Popular for wing hold down bolts. Knurling on outside of head is easy to grip or use slot head screwdriver. Head shape is known as "Fillister". Nylon Knurl Head Slotted Screw - 6-32 x 1". 6 pcs. Nylon Knurl Head Slotted Screw - 8-32 x 1 1/4". 6 pcs. Nylon Knurl Head Slotted Screw - 10-32 x 1 1/2". 6 pcs. 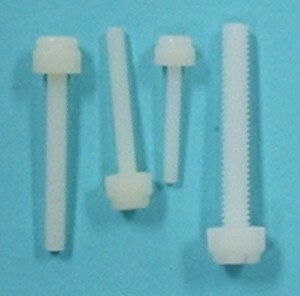 Nylon Knurl Head Slotted Screw - 1/4-20 x 1 3/4". 6 pcs.